It is not yet clear whether the election of Susilo Bambang Yudhoyono as president of Indonesia is a positive development for West Papua and whether he will bring peace and stability to the restive territory any closer. The signals are ambiguous and we simply do not know what policies the new president will pursue when in office. Susilo was the preferred candidate of many Papuans. He was regarded as the more competent and wiser leader who in the past has supported dialogue as a means of resolving the West Papua conflict and made encouraging statements about reforming the military. However, his attraction may have been more a reflection of Megawati's inadequacies than his own merits. Megawati was a largely ineffectual leader, an ultra-nationalist who relied on military solutions to political problems and left West Papua in a state of chaos through her attempt to divide the territory into three provinces in contravention of a law on special autonomy. On the other hand, Susilo is a military man who retains a team of retired military officers from the Soeharto era as advisers. His reformist credentials are questionable given his support for the military's territorial command structure, which provides it with a means of control and political influence at the provincial and local level. This is highly significant in the context of Indonesia's current devolution of power from Jakarta to the regions. It should also be remembered that Susilo, while an apparent supporter of dialogue, did little to resolve the West Papua conflict when in the influential position of security minister under presidents Wahid and Megawati, despite some early progress under Wahid. Furthermore, although his hand may have been forced by hard-line military leaders, Susilo was the government minister responsible for declaring and coordinating martial law in Aceh in 2003/2004. Unfortunately, policy debate on West Papua and Aceh was notable by its absence from the election campaign so we are none the wiser about what approach Susilo might adopt. One point that needs to be made very strongly is that although the Indonesian national elections were proclaimed as peaceful, free and fair, West Papua and Aceh continue to suffer from huge democratic deficits. Local political parties are forbidden and people are still thrown into jail for exercising their right to express their support for self-determination and independence. There can be no meaningful progress towards democracy as long as human rights remain unprotected, the rule of law does not function properly and military personnel enjoy impunity for gross violations. One of Susilo's first tasks should be to attempt the peaceful resolution of the West Papua conflict. At all times he should ensure that human rights and an understanding of the specific grievances of the West Papuan people remain at the center of his policy making. He should concentrate on three key issues. 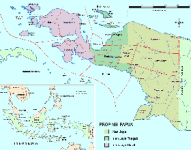 Firstly, the political status of West Papua. He must resolve the crisis caused by Megawati's divisive three-way split policy and her failure to establish a Papuan People's Assembly as required by the special autonomy law. He must also remember that special autonomy falls far short of the self-determination desired by the overwhelming majority of Papuans since the fraudulent 'Act of Free Choice' in 1969. His response should be to institute a process of peaceful dialogue with West Papuan representatives to consider all options for the future of the territory. Secondly, he must address the need for demilitarization of West Papua. The continuing military operations in West Papua and the activities of pro-Jakarta militias are inimical to the peaceful resolution of the conflict and the establishment of democracy. He should end all military operations, start a process of demilitarization and halt all militia activities. He should also respect the proposal of the West Papuan people for West Papua to be made a 'Land of Peace'. The recent announcement that the military would lose its role in protecting vital assets, such as the Freeport mine and BP Tangguh project, was encouraging. Susilo should ensure that this decision is implemented without delay. Thirdly, he must take immediate steps to improve the human rights situation. He should press for credible investigations and prosecutions, according to international standards, of all serious crimes committed in West Papua since its occupation by Indonesia in 1963. In particular he should respond to the findings of the National Commission on Human Rights that gross violations were committed in Wasior in 2001 and Wamena in 2003. He should press the Attorney General to complete his own inquiry into these incidents without delay and prosecute those responsible, including those with command responsibility. He should note the persistent and credible allegations of military involvement in the killing of an Indonesian and two Americans near the Freeport mine in August 2002 and he should ensure that the police are able to complete their current follow-up investigation without obstruction and harassment. Finally, he should respond positively to requests for UN human rights rapporteurs and monitors to visit West Papua and ensure that human rights defenders are not subject to threats and intimidation and that they are freely able to carry out their vital work. The writer is a researcher for the London-based TAPOL, the Indonesia Human Rights Campaign. He can be reached at plovers@gn.apc.org.